The laser printer portion of this all-in-one machine gave up the ghost and [Entropia] couldn’t get it working again. 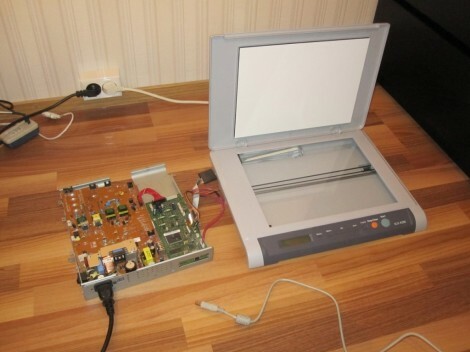 But the scanner was still functioning so he decided to separate the scanner from its dead printer module. The model in question is a Samsung SCX-4200. The design is actually perfect for separation because the scanner sits on top of the out feed tray of the printer. It can even be lifted to allow more room for printed pages to pile up. All he has to do is separate the hinged connector and reroute the flat cables. But the real question in [Entropia’s] mind was whether or not the control board would work without the laser printer components connected to it. He carefully disassembled the unit, spilling toner here and there which is left over from a catastrophic knock-off toner cartridge incident. A quick test showed him that although the drivers complain that the paper tray is open, the scanner does still work. He glued the controller board seen on the left to the bottom of the scanner enclosure, and added some felt feet. Now his scanner is closer to the size you’d expect. And on the plus side he gained a geared stepper motor, laser scanning unit, exhaust fan, and a couple of solenoids to use in future projects. Nice to see it not going in the bin. in the long term I’d removed the stock power supply. as the HVPS and Fuser switching parts of the stock power supply are no longer needed. pinouts are usually pretty extensively silked on samsung printers so figuring out the photo interupter and door switch functionality should be relitively easy. You may think that’s funny, but honestly it’s ridiculous :( My Canon all-in-one does this and I wish I knew how to hack it so that it wouldn’t. buy a new scanner for 50$, seriously how do you justify spending such a rediculous amount of time to make some obsolete garbage resolution device, how much is your time worth? LOL has just graciously offered to landfill your junk in his backyard… Send away! This is comedy gold, I hope LOLs comment stays up. Admittedly the scanner isn’t as good as a dedicated scanner but I’m not working in the graphic design industry either. SCX-4200 can scan at 600 dpi with some noise, and that’s more than good enough when you scale it down to 300 dpi. If hacking the solution together was fun then the time was well spent. Simple as that. The task can be its own reward. This is why I don’t like to buy all-in-one anything. I have a cannon multifunction mp258 printer. The scanner wont work without catridge installed. Can i separate it in the same way so that at least scanner can be used? 1) Will the scanner work if I disconnect everything else from the controller board except these two connectors? It’s good, but not always applicable. Here, my ink jet scanner can not work alone. It makes mistakes and only happens if the toner head or at least the electronics is mounted, but it can not scan. Inserts an error message. And it is very convenient even more so that the control board is very small and can hide under the scanner itself and remain invisible. Without headless toner, the control board is only 15×15 centimeters somewhere, not here.